"Sabtah" redirects here. For the biblical figure, see Sabtah (biblical figure). For other uses, see Ceuta (disambiguation). Ceuta (/ˈsjuːtə/ or /ˈseɪʊtə/) is an 18.5 km2 (7 sq mi; 4,571 acres) Spanish autonomous city on the north coast of Africa, separated by 14 km (9 mi) from Cadiz province on the Spanish mainland by the Strait of Gibraltar and sharing a 6.4 km (4 mi) land border with M'diq-Fnideq Prefecture in the Kingdom of Morocco. It lies along the boundary between the Mediterranean Sea and the Atlantic Ocean and is one of nine populated Spanish territories in Africa and, along with Melilla, one of two populated territories on mainland Africa. It was part of Cádiz province until 14 March 1995 when both Ceuta and Melilla's Statutes of Autonomy were passed, the latter having been part of Málaga province. The name Abyla has been said to have been a Punic name ("Lofty Mountain" or "Mountain of God") for Jebel Musa, the southern Pillar of Hercules. In fact, it seems that the name of the mountain was actually Habenna (Punic: 𐤀𐤁‬𐤍‬, ʾBN, "Stone" or "Stele") or ʾAbin-ḥīq (𐤀𐤁‬𐤍𐤇‬𐤒, ʾBNḤQ, "Rock of the Bay"), in reference to the nearby Bay of Benzú. The name was hellenized variously as Ápini (Greek: Ἄπινι), Abýla (Ἀβύλα), Abýlē (Ἀβύλη), Ablýx (Ἀβλύξ), and Abílē Stḗlē (Ἀβίλη Στήλη, "Pillar of Abyla") and in Latin as Mount Abyla (Abyla Mons) or the Pillar of Abyla (Abyla Columna). The settlement below Jebel Musa was later renamed for the seven hills around the site, collectively referred to as the "Seven Brothers" (Greek: Ἑπτάδελφοι, Heptádelphoi; Latin: Septem Fratres). In particular, the Roman stronghold at the site took the name "Fort at the Seven Brothers" (Castellum ad Septem Fratres). This was gradually shortened to Septem (Σέπτον, Sépton) or, occasionally, Septum or Septa. These clipped forms continued as Berber Sebta and Arabic Sebtan or Sabtah (Arabic: سبتة‎‎), which themselves became Ceuta in Portuguese (pronounced [ˈsew.tɐ]) and Spanish (pronounced [ˈθeuta]). Controlling access between the Atlantic Ocean and the Mediterranean Sea, the Strait of Gibraltar is an important military and commercial chokepoint. The Phoenicians realized the extremely narrow isthmus joining the Peninsula of Almina to the African mainland makes Ceuta eminently defensible and established an outpost there in the early 1st millennium BC. The Greek geographers record it by variations of "Abyla", the ancient name of nearby Jebel Musa. Beside Calpe, the other Pillar of Hercules now known as the Rock of Gibraltar, the Phoenicians established Kart at what is now San Roque, Spain. Other good anchorages nearby became Phoenician and then Carthaginian ports at what are now Tangiers and Cadiz. After Carthage's destruction in the Punic Wars, most of northwest Africa was left to the Roman client states of Numidia and—around Abyla—Mauretania. Punic culture continued to thrive in what the Romans knew as "Septem". After Thapsus, Caesar and his heirs began annexing north Africa directly as Roman provinces but, as late as Augustus, most of Septem's Berber residents continued to speak and write in Punic. Caligula assassinated the Mauretanian king Ptolemy in AD 40 and seized his kingdom, which Claudius organized in 42, placing Septem in the province of Tingitana and raising it to the level of a colony. It subsequently romanized and thrived into the late 3rd century, trading heavily with Roman Spain and becoming well known for its salted fish. Roads connected it overland with Tingis (Tangiers) and Volubilis. Under Theodosius I in the late 4th century, Septem still had 10,000 inhabitants, nearly all Christian citizens speaking Latin and African Romance. Vandals, probably invited by Count Boniface as protection against the empress dowager, crossed the strait near Tingis around 425 and swiftly overran Roman North Africa. Their king Gaiseric focused his attention on the rich lands around Carthage; although the Romans eventually accepted his conquests and he continued to raid them anyway, he soon lost control of Tingis and Septem in a series of Berber revolts. When Justinian decided to reconquer the Vandal lands, his victorious general Belisarius continued along the coast, making Septem an outpost of the Byzantine Empire around 533. Unlike the Roman administration, however, the Byzantines did not push far into hinterland and made the more defensible Septem their regional capital in place of Tingis. Epidemics, less capable successors, and overstretched supply lines forced a retrenchment and left Septem isolated. It is likely that its count (comes) was obliged to pay homage to the Visigoth Kingdom in Spain in the early 7th century. There are no reliable contemporary accounts of the end of the Islamic conquest of the Maghreb around 710. Instead, the rapid Muslim conquest of Spain produced romances concerning Count Julian of Septem and his betrayal of Christendom in revenge for the dishonor that befell his daughter at King Roderick's court. Allegedly with Julian's encouragement and instructions, the Berber convert and freedman Tariq ibn Ziyad took his garrison from Tangiers across the strait and overran the Spanish so swiftly that both he and his master Musa bin Nusayr fell afoul of a jealous caliph, who stripped them of their wealth and titles. After the death of Julian, sometimes also described as a king of the Ghomara Berbers, Berber converts to Islam took direct control of what they called Sebta. It was then destroyed during their great revolt against the Umayyad Caliphate around 740. Sebta subsequently remained a small village of Muslims and Christians surrounded by ruins until its resettlement in the 9th century by Mâjakas, chief of the Majkasa Berber tribe, who started the short-lived Banu Isam dynasty. His great-grandson briefly allied his tribe with the Idrisids, but Banu Isam rule ended in 931 when he abdicated in favor of Abd ar-Rahman III, the Umayyad caliph of Cordoba. Ceuta reverted to Moorish Andalusian rule in 927 along with Melilla, and later Tangier, in 951. Chaos ensued with the fall of the Spanish Umayyads in 1031. Following this, Ceuta and Muslim Iberia were controlled by successive North African dynasties. Starting in 1084, the Almoravid Berbers ruled the region until 1147, when the Almohads conquered the land. Apart from Ibn Hud's rebellion in 1232, they ruled until the Tunisian Hafsids established control. The Hafsids' influence in the west rapidly waned, and Ceuta's inhabitants eventually expelled them in 1249. After this, a period of political instability persisted, under competing interests from the kingdoms of Fez and Granada. The Fez finally conquered the region in 1387, with assistance from Aragon. The Royal Walls of Ceuta, built from 962 to the 18th century, and navigable moats. On the morning of 21 August 1415, King John I of Portugal led his sons and their assembled forces in a surprise assault that would come to be known as the Conquest of Ceuta. The battle was almost anti-climactic, because the 45,000 men who traveled on 200 Portuguese ships caught the defenders of Ceuta off guard and only suffered eight casualties. By nightfall the town was captured. On the morning of August 22, Ceuta was in Portuguese hands. Álvaro Vaz de Almada, 1st Count of Avranches was asked to hoist what was to become the flag of Ceuta, which is identical to the flag of Lisbon, but in which the coat of arms of the Kingdom of Portugal was added to the center; the original Portuguese flag and coat of arms of Ceuta remained unchanged, and the modern-day Ceuta flag features the configuration of the Portuguese shield. From 1415 to 1437, Pedro de Meneses became the first governor of Ceuta. The Benemerine sultan started the 1418 siege but was defeated by the first governor of Ceuta before reinforcements arrived in the form of John, Constable of Portugal and his brother Henry the Navigator who were sent with troops to defend Ceuta. Under King John I's son, Duarte, the colony at Ceuta rapidly became a drain on the Portuguese treasury. Trans-Saharan trade journeyed instead to Tangier. It was soon realized that without the city of Tangier, possession of Ceuta was worthless. In 1437, Duarte's brothers Henry the Navigator and Fernando, the Saint Prince persuaded him to launch an attack on the Marinid sultanate. The resulting Battle of Tangier (1437), led by Henry, was a debacle. In the resulting treaty, Henry promised to deliver Ceuta back to the Marinids in return for allowing the Portuguese army to depart unmolested, which he reneged on. In 1578 King Sebastian of Portugal died at the Battle of Alcácer Quibir (known as the Battle of Three Kings) in what is today northern Morocco, without descendants, triggering the 1580 Portuguese succession crisis. His granduncle, the elderly Cardinal Henry, succeeded him as King, but Henry also had no descendants, having taken holy orders. When the cardinal-king died two years after Sebastian's disappearance, three grandchildren of King Manuel I of Portugal claimed the throne: Infanta Catarina, Duchess of Braganza, António, Prior of Crato, and Philip II of Spain (Uncle of former King Sebastian of Portugal), who would go on to be crowned King Philip I of Portugal in 1581, uniting the two crowns and overseas empires known as the Iberian Union, which allowed the two kingdoms to continue without being merged. Fort of the Desnarigado, built in the 19th century. It houses a museum. Bastion of la Coraza Alta on the shore of the Playa del Chorrillo beach. On 1 January 1668, King Afonso VI of Portugal recognized the formal allegiance of Ceuta to Spain and formally ceded Ceuta to King Carlos II of Spain by the Treaty of Lisbon. The city was attacked by Moroccan forces under Moulay Ismail during the Siege of Ceuta (1694-1727). During the longest siege in history, the city underwent changes leading to the loss of its Portuguese character. While most of the military operations took place around the Royal Walls of Ceuta, there were also small-scale penetrations by Spanish forces at various points on the Moroccan coast, and seizure of shipping in the Strait of Gibraltar. Culturally, modern Ceuta is part of the Spanish region of Andalusia. It was attached to the province of Cádiz until 1925, the Spanish coast being only 20 km (12.5 miles) away. It is a cosmopolitan city, with a large ethnic Arab Muslim minority as well as Sephardic Jewish and Hindu minorities. Since 2010, Ceuta (and Melilla) have declared the Muslim holiday of Eid al-Adha, or Feast of the Sacrifice, an official public holiday. It is the first time a non-Christian religious festival has been officially celebrated in Spain since the Reconquista. 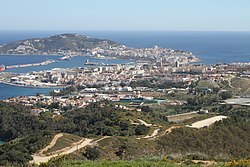 Ceuta has a maritime-influenced Subtropical/Mediterranean climate, similar to nearby Spanish and Moroccan cities such as Tarifa, Algeciras or Tangiers. The average diurnal temperature variation is relatively low; the average annual temperature is 18.8 °C (65.8 °F) with average yearly highs of 21.4 °C (70.5 °F) and lows of 15.7 °C (60.3 °F) though the Ceuta weather station has only been in operation since 2003. Ceuta has relatively mild winters for the latitude, while summers are warm yet milder than in the interior of Southern Spain, due to the moderating effect of the Straits of Gibraltar. Summers are very dry, but yearly precipitation is still at 849 mm (33.4 in), which could be considered a humid climate if the summers were not so arid. The Palacio de la Asamblea de Ceuta is the seat of the Assembly of Ceuta. Ceuta has held elections every four years since 1979, for its 25-seat assembly. The leader of its government was the Mayor until the Autonomy Statute had the title changed to the Mayor-President. As of 2011[update], the People's Party (PP) won 18 seats, keeping Juan Jesús Vivas as Mayor-President, which he has been since 2001. The remaining seats are held by the regionalist Caballas Coalition (4) and the Socialist Workers' Party (PSOE, 3). Due to its small population, Ceuta elects only one member of the Congress of Deputies, the lower house of the Spanish legislature. As of 2011[update] election, this post is held by Francisco Márquez de la Rubia of the PP. 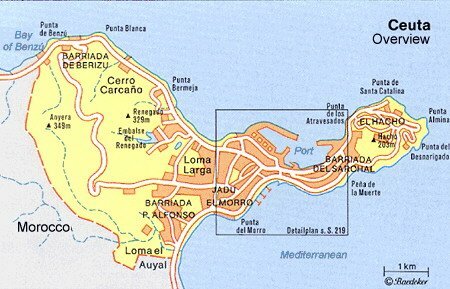 Ceuta is subdivided into 63 barriadas ("neighborhoods"), such as Barriada de Berizu, Barriada de P. Alfonso, Barriada del Sarchal, and El Hacho. The government of Morocco has repeatedly called for Spain to transfer the sovereignty of Ceuta and Melilla, together with the rest of the Spanish plazas de soberanía on the North African coast, on the grounds of asserting its territorial integrity. Morocco has claimed the territories are colonies. One of the chief arguments used by Morocco to reclaim Ceuta comes from geography, as this enclave, which is surrounded by Morocco and the Mediterranean Sea, has no territorial continuity with the rest of Spanish territory. This argument was originally developed by one of the founders of the Moroccan Istiqlal Party, Alal-El Faasi, who openly advocated the Moroccan conquest of Ceuta and other territories under Spanish rule. The official currency of Ceuta is the euro. It is part of a special low tax zone in Spain. Ceuta is one of two Spanish port cities on the northern shore of Africa, along with Melilla. They are historically military strongholds, free ports, oil ports, and also fishing ports. Today the economy of the city depends heavily on its port (now in expansion) and its industrial and retail centers. Ceuta Heliport is now used to connect the city to mainland Spain by air. Lidl, Decathlon Group and El Corte Inglés (hardware) have branches in Ceuta. There is also a casino. Border trade between Ceuta and Morocco is active because of advantage of tax-free status. Thousands of Moroccan women are involved in porter trade daily. Moroccan dirham is actually used in such trade, despite the fact that prices are marked in euro. The city's Port of Ceuta receives high numbers of ferries each day from Algeciras in Andalusia in the south of Spain, along with Melilla and the Canary Islands. The closest airport is Sania Ramel Airport in Morocco. A single road border checkpoint to the south of Ceuta near Fnideq allows for cars and pedestrians to travel between Morocco and Ceuta. An additional border crossing for pedestrians also exists between Benzú and Belyounech on the northern coast. The rest of the border is closed and inaccessible. There is a bus service throughout the city, and while it does not pass into neighboring Morocco, it services both frontier crossings. Due to its location, Ceuta is home to a mixed ethnic and religious population. The two main religious groups are Christians and Muslims. As of 2006 approximately 50% of the population was Christian and approximately 48% Muslim. However, by 2012, the portion of Ceuta's population that identify as Roman Catholic was 68.0%, while the portion of Ceuta's population that identify as Muslim was 28.3%. Spanish is the primary and official language of the enclave. Moroccan Arabic is widely spoken, as are Berber and French. 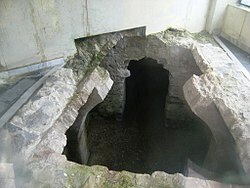 Remains of the Late Roman Christian Basilica and Necropolis of Ceuta dated to the mid-4th century CE or the beginning of the 5th century CE. Cathedral of St. Mary of the Assumption, completed in 1726. Christianity has been present in Ceuta continuously from late antiquity, as evidenced by the ruins of a basilica in downtown Ceuta and accounts of the martyrdom of St Daniel Fasanella and his Franciscans in 1227. The town's Grand Mosque had been built over a Byzantine-era church. In 1415, the year of the city's conquest, the Portuguese converted the Grand Mosque into Ceuta Cathedral. The present form of the cathedral dates to refurbishments undertaken in the late 17th century, combining baroque and neoclassical elements. It was dedicated to St Mary of the Assumption in 1726. The Roman Catholic Diocese of Ceuta was established in 1417. It incorporated the suppressed Diocese of Tanger in 1570. The Diocese of Ceuta was a suffragan of Lisbon until 1675, when it became a suffragan of Seville. In 1851, Ceuta's administration was notionally merged into the Diocese of Cadiz and Ceuta as part of a concordat between Spain and the Holy See; the union was not actually accomplished, however, until 1879. As in Melilla, Ceuta is attractive to migrants who try to use it as an entry to Europe. As a result the enclave is surrounded by double fences that are 6 m (20 ft) high and hundreds of migrants congregate near the fences waiting for a chance to cross them. The fences are regularly stormed by migrants trying to claim asylum once they enter Ceuta. Eclectic House of the Dragons, built in 1905. Al-Idrisi (1100 in Ceuta – 1165 in Ceuta) was an Arab Muslim geographer, cartographer and Egyptologist. He lived in Palermo at the court of King Roger II of Sicily, known for the "Tabula Rogeriana"
Álvaro of Braganza ( 1440 - 1504) was a president of Council of Castile. George Camocke (1666-1732) was a Royal Navy captain and former admiral for Spain who was exiled to Ceuta to live out the last years of his life. Don Fernando de Leyba (1734 in Ceuta - 1780) was a Spanish officer who served as the third governor of Upper Louisiana from 1778 until his death. José Ramón López (1950) was a sprint canoer. He won the silver medal in the 1976 Summer Olympics. Miguel Bernardo Bianquetti (born 1951 in Ceuta), known as Migueli is a Spanish retired footballer who played central defender. Francisco Lesmes and Rafael Lesmes Bobed brothers and Spanish footballers. Pedro Aviles Gutiérrez (Ceuta, 1956) is a Spanish novelist from Madrid. Nayim (Ceuta, 1966) is a retired Spanish footballer; he scored a last-minute goal for Real Zaragoza in the 1995 UEFA Cup Winners' Cup Final. Mohamed Taieb Ahmed (1975, Ceuta) is a Spanish-Moroccan drug lord  responsible for trafficking hashish across the Strait of Gibraltar and into Spain. Lorena Miranda (Ceuta, 1991) is a Spanish female water polo player. She won the silver medal in Water polo at the 2012 Summer Olympics. ^ a b "Decision Spain >> Resources >> Municipalities without testimony >> Ceuta + Melilla". Decision Espana. Retrieved 16 August 2016. ^ Ferrer-Gallardo, Xavier. "The Spanish–Moroccan border complex: Processes of geopolitical, functional and symbolic rebordering". Political Geography. 27 (3): 301–321. doi:10.1016/j.polgeo.2007.12.004. ^ Verónica Rivera (December 2006). "IMPORTANCIA Y VALORACIÓN SOCIOLINGÜÍSTICA DEL DARIJA EN EL CONTEXTO DE LA EDUCACIÓN SECUNDARIA PÚBLICA EN CEUTA" [Importance and Socio-Linguistic Valuation of Darija in the Context of Public Secondary Education in Ceuta]. REVISTA ELECTRÓNICA DE ESTUDIOS FILOLÓGICOS (in Spanish) (12). ISSN 1577-6921. ^ Fernández García, Alicia (2016). "Nacionalismo y representaciones lingüísticas en Ceuta y en Melilla". Revista de Filología Románica. Madrid: Universidad Complutense de Madrid. 33 (1): 23–46. doi:10.5209/RFRM.55230. ISSN 0212-999X. ^ Cauvin & al. (1843). ^ Bonney & al. (1907), p. 26. ^ a b c Smith (1854). ^ a b Smedley & al. (1845), p. 49. ^ In, e.g., Pomponius Mela. ^ Walter E. Kaegi (4 November 2010). Muslim Expansion and Byzantine Collapse in North Africa. Cambridge University Press. p. 256. ISBN 978-0-521-19677-2. ^ A Cyclopædia of Biblical Literature. 2. John Kitto, William Lindsay Alexander. 1864. p. 350. ^ Mommsen, Theodore, The Provinces of the Roman Empire, s.v. "Africa" . ^ Gibb, Hamilton Alexander Rosskeen; Johannes Hendrik Kramers; Bernard Lewis; Charles Pellat; Joseph Schacht (1994), The Encyclopaedia of Islam, E.J. Brill, p. 690 . ^ López de Coca Castañer, José Enrique (1998). "Granada y la expansión portuguesa en el Magreb extremo". Historia. Instituciones. Documentos. Seville: Universidad de Sevilla (25): 351. ISSN 0210-7716. ^ Payne, Stanley G., A History of Spain and Portugal, Vol.1, Chap.10 "The Expansion"
^ "Ceuta". fortified-places.com. Retrieved 17 September 2015. ^ * Kamen, Henry (1999). Philip of Spain. Yale University Press. p. 177. ISBN 9780300078008. ^ Griffin, H (2010). Ceuta Mini Guide. Mirage. ISBN 978-0-9543335-3-9. ^ "History of Ceuta". Archived from the original on 5 March 2012. Retrieved 2012-03-01. ^ "Franco monument now part of a rubbish dump in Ceuta". Archived from the original on 7 December 2012. ^ "Resistir en el monte del Renegado". El País. 22 March 2009. Retrieved 2009-06-17. ^ "Ceuta y Melilla son España, dice Juan Carlos I; Sebta y Melilia son nuestras, responde Mohamed VI". Blogs.periodistadigital.com. 22 February 1999. Retrieved 2009-06-17. ^ "Public Holidays and Bank Holidays for Spain". Qppstudio.net. Archived from the original on 30 September 2011. Retrieved 3 September 2011. ^ "Ceuta, Spain — Climate Summary". weatherbase. Retrieved 8 December 2014. ^ a b c "Valores climatológicos normales. Ceuta" [Normal climate values. Ceuta]. AEMET (in Spanish). Agencia Estatal de Meteorología. Retrieved 11 August 2015. ^ "Monthly Averages for Ceuta, Spain". Weather.com. Archived from the original on 2012-10-20. Retrieved 16 August 2016. ^ "Ceuta Monthly Climate Averages". World Weather Online. Retrieved 16 August 2016. ^ "Valores extremos. Ceuta — Selector" [Extreme values. Ceuta - Selector]. AEMET (in Spanish). Agencia Estatal de Meteorología. Retrieved 16 August 2016. ^ "Ley Orgánica 1/1995, de 13 de marzo, Estatuto de Autonomía de Ceuta". Noticias.juridicas.com. Retrieved 2009-06-17. ^ "Resultados Electorales en Ceuta: Elecciones Municipales 2011 en EL PAÍS" (in Spanish). EDICIONES EL PAÍS S.L. 2011. Retrieved 16 August 2016. ^ "Congress / Listing of Members by electoral district". Congreso de los Diputados (in Spanish). 12 January 2011. Archived from the original on 24 September 2015. Retrieved 25 August 2013. ^ "El servicio de Policia de Barriadas podria funcionar a partir del 15 de septiembre" [The Police Service of Barriadas could work from September 15]. El Pueblo de Ceuta (in Spanish). Archived from the original on 20 July 2011. Retrieved 2009-06-17. ^ "Map of Ceuta". planetware. ^ "Códigos postales de Ceuta en Ceuta". Codigo-postal.info. Retrieved 2009-06-17. ^ Gold, Peter (2000). Europe or Africa? A contemporary study of the Spanish North African enclaves of Ceuta and Melilla. Liverpool University Press. pp. XII–XIII. ISBN 0-85323-985-1. ^ Castan Pinos, J. (2014) ‘The Spanish-Moroccan relationship: combining bonne entente with territorial disputes’, in K. Stoklosa (ed.) Living on the border. European Border Regions in Comparison (p. 103). Abingdon: Routledge. ^ a b "Economic Data of Ceuta, de ceutna digital". Ceuta.es. Archived from the original on 10 April 2010. Retrieved 17 June 2009. ^ O'Reilly, Gerry; O'Reilly, J. G. (1994). IBRU, Boundary and Territory Briefing. Ceuta and the Spanish Sovereign Territories: Spanish and Moroccan. pp. 6–7. ISBN 9781897643068. Retrieved 2009-06-17. ^ "Morocco 'mule women' in back-breaking trade from Spain enclave". 2017-10-06. Retrieved 2018-05-11. ^ "The economics of exclaves". 2018-04-24. Retrieved 2018-05-11. ^ (www.dw.com), Deutsche Welle. "Moroccan women used as 'mules' to avoid tariffs | DW | 11.05.2018". DW.COM. Retrieved 2018-05-11. ^ Roa, J. M. (2006). "Scholastic achievement and the diglossic situation in a sample of primary-school students in Ceuta". Revista Electrónica de Investigación Educativa. 8 (1). ^ "Interactivo: Creencias y prácticas religiosas en España". lavanguardia.com. Retrieved 10 September 2017. ^ "Languages Across Europe – Spanish". BBC. 2014-10-14. Archived from the original on 2018-04-05. ^ Sayahi, Lotfi (2011). "Spanish in Contact with Arabic". In Díaz-Campos, Manuel. The Handbook of Hispanic Sociolinguistics. Chichester, UK: Blackwell Publishing. pp. 476–477. doi:10.1002/9781444393446.ch22. ISBN 978-1-4051-9500-3. ^ Roa-Venegas, José María (2006). "Scholastic Achievement and the Diglossic Situation in a Sample of Primary-School Students in Ceuta". Revista Electrónica de Investigación Educativa. 8 (1): 3, 12 – via ResearchGate. ^ Villada, Fernando. "Ceuta huellas del cristianismo en Ceuta". academia.edu. Retrieved 10 September 2017. ^ "Catholic Encyclopedia: Tingis". Newadvent.org. 1 July 1912. Retrieved 2010-08-08. ^ "Catholic Encyclopedia: Cadiz". Newadvent.org. 1 November 1908. Retrieved 2010-08-08. ^ "Hundreds of migrants storm fence to reach Spanish enclave of Ceuta". BBC. 17 February 2017. ^ "Vuelve 'El Nene'". Interviu. 14 January 2008. Retrieved 20 October 2017. ^ "Listado de corporaciones locales españolas hermanadas con Europa" (PDF). Spanish Federation of Municipalities and Provinces. ^ Corrales, Carlos (5 August 2012). 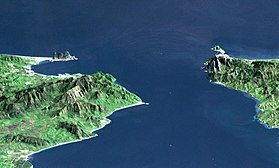 "Ceuta y Algeciras, tres lustros como ciudades hermanadas". Europa Sur. ^ Durio, Pablo Manuel (19 September 2009). "Cádiz tiene ya una familia más que numerosa". Diario de Cádiz. ^ Parodi, Luis (27 November 2007). "Vivas visitará el jueves la Casa de Ceuta en Cádiz antes de regresar". El Pueblo de Ceuta. Bonney, Thomas George; et al. (1907), The Mediterranean: Its Storied Cities and Venerable Ruins, New York: James Pott & Co .
Cauvin, Joseph; et al., eds. (1843), "Abila", Lempriere's Classical Dictionary..., London: Longman, Brown, Green, & Longmans . Dyer, Thomas H. (1873), "Septem Fratres", A Dictionary of Greek and Roman Geography..., Vol. II, London: John Murray, p. 965 . Smedley, Edward; et al., eds. (1845), "Mauritania", Encyclopaedia Metropolitana..., Vol. XXII, London: B. Fellowes & al., pp. 48–49 . Smith, Philip (1854), "Abyla", Dictionary of Greek and Roman Geography..., London: Walton & Maberly . Wikimedia Commons has media related to Ceuta. Wikivoyage has a travel guide for Ceuta. "Ceuta" . Encyclopædia Britannica (11th ed.). 1911.